10. Big Bird. While this costume has really just come out of the first presidential debate, its important to note searches for “Big Bird Costume” have increased 600% since the first presidential debate. So while you may have a culturally relevant costume this year, be prepared to not be the only Big Bird at your party. 9. Apple Maps. 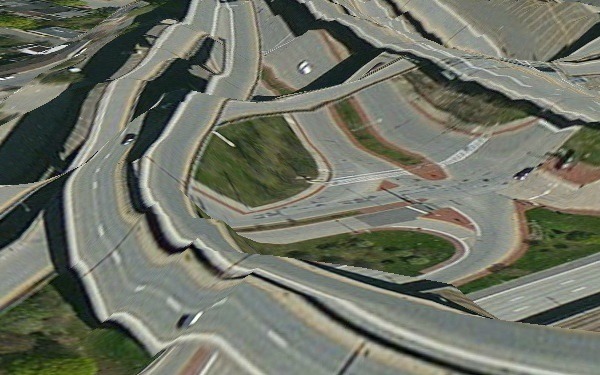 You would need to use some creativity here, but some Salvador Dali inspired roads stuck to yourself might be an interesting conversation starter. 7. Suri Cruise. I have to give props to @ariannap for this one (as she suggested it as my own costume…I’m not sure why). I’m envisioning a fabulous designer outfit and snarky commentary all night long. 6. A binder full of Woman. Ok, so maybe another politically charged costume, but the internet has had a field day with it – so ya know. Meme it up. 5. Pirate Cloud. I don’t really follow these kinds of things, but it sounds like a pretty awesome Halloween costume. 4. Instagram-Addicted Hipster. Please note that this does not count as a costume if this is your everyday life. That means approximately 90% of Instagram users in Portland do not qualify. Bonus points for posting photos of every piece of candy/drink you consume at your Halloween party. 2. Anyone who’s been digitally remixed by PBS studios. This makes Mr. Rogers, Julia Child and Bob Ross all culturally relevant again in my book. You should probably have their videos queued up on your phone for those less in the know. 1. Crashing Google/Facebook/Microsoft/Apple stock. I mean, if you go Google you’re going to have a lot further to fall, than Facebook who never really got off the ground. But you do have a new chromebook to rely on. I guess its a good time to buy. Well, there you have it. All my creative nerd Halloween ideas. You’re welcome.